The perfect solution for when you want an effortlessly tasty meal, full of robust flavours and a hint of the exotic: Tabbouleh. But this is (to borrow Jeremy Mansfield's phrase) a zhooszhed up rendition of the classic. And I must say I quite like this version. Feel free to add some black olives as well - they would complement the flavours beautifully. I'm submitting this to Regional Recipes (February's theme is the Middle East), newly hosted by Joanne of Eats Well With Others (one of my favourite bloggers - go and visit if you haven't been yet!) and originally created by Darlene from Blazing Hot Wok. Watch this space for more Middle-Eastern treats for the month of February - this is one cuisine I cannot get enough of! 1. Soak couscous in 2 cups of water for about 6 - 8 minutes until all the water has been absorbed. Fluff up with a fork, dressing with 1 tbsp of lemon juice and 1 tbsp of olive oil. Season to taste with salt, being careful not to over salt. 2. 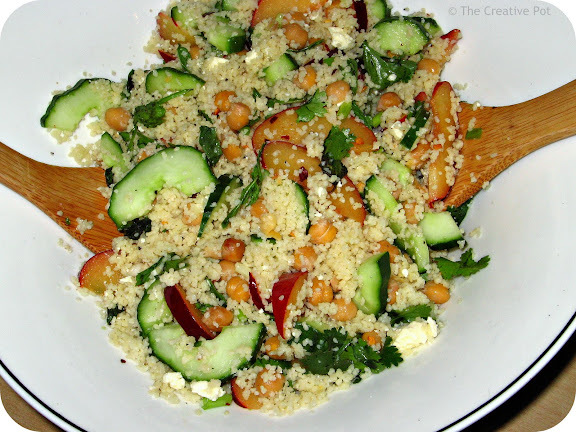 Add chickpeas, plums, cucumber and spring onions to the couscous, stirring gently to combine. 3. Crumble the feta cheese over, and add the herbs to the mix. Toss again, to ensure even distribution. 4. Drizzle with the remaining olive oil and lemon juice and add salt & pepper to taste. 5. Serve at room temperature, or cover and refrigerate to serve cold. I've been wanting to try couscous forever. And, Mmmm! it's has feta in it! You are so sweet! This dish looks a-MA-zing! I love Middle Eastern food as well and am SO glad that you are excited about it. I can't wait to see what treats you have in store for the round-up. Tabbouleh is one of my favorite Middle Eastern dishes - it is really the ideal salad in my opinion. I love tabbouleh - this version has me drooling! Definitely going on the must make soon list!